And this is what I discovered...! 'I ran looping my way around the park for six miles; and even though there is slight stiffness still in the ankle, it is now improving noticeably, almost each outing. It is especially helping leaving a day in between each run. The main thing I notice now is that I am not as fit as I was...! But we live in a world of cause and effect and if I could stay as fit as I did when I was running more... Without running, then that would turn everything on its head in terms of understanding the challenges of being a spirit in a human body. So day 22 last year was not very different to day 22 this year! The weather was similar to England! But when I put myself to the test, I find I am not as fast as in the past, and as I said in last year's blog, it would of course go against the natural way of our world of cause and effect if I could stay fast without training for fast...! We had eaten croissant and drunk coffee before we ran, and now we returned to the cafe for orange juice, Spanish omelette and cafe con leche... And cake for me! 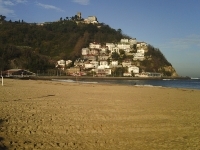 Then we moved home again, to a new part of San Sebastián, closer to the sea and we have a gym on site...! I wanted to do them again, because the movements are finding where I am stuck, where I need to open more, where there is weakness and I am liking these things being revealed to me. So a year on, the journey does not look so very different, but in truth nothing is ever the same in each moment.